Use this free tool to figure your monthly payments on a 15-year FRM for a given loan amount. Current 15-year home loan rates are shown beneath the calculator. The following table highlights locally available current mortgage rates. By default 15-year purchase loans are displayed. Clicking on the refinance button switches loans to refinance. Other loan adjustment options including price, down payment, home location, credit score, term & ARM options are available for selection in the filters area at the top of the table. In low interest rate environments consumers typically prefer the certainty of fixed-rate loans over adjustable-rates. In high or rising interest rate environments consumers may see a larger relative discount in ARM loans which can help shift their preference across. Currently interest rates across the global economy are near 5,000 year lows, thus most home buyers try to lock in fixed payments over the longest duration possible - which is a 30-year FRM. Some homeowners who have built up equity in their homes & have rising incomes see how long it takes to pay off a 30-year loan & decide to switch to refinance into a shorter duration loan. When people choose to refinance a 30-year loan into a shorter loan they typically choose a 15-year loan, though 10-year & 20-year options are also available. 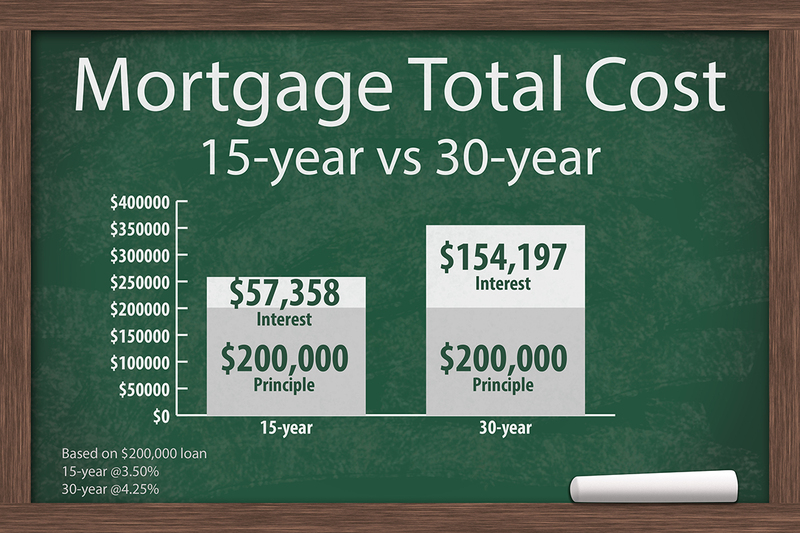 The following table compares monthly payments, interest rates & total interest due over the life of a $220,000 loan. These payments presume a 20% down payment on the home and cover principal + interest on the loan. Insurance, HOA fees, maintenance & property taxes are not included.